Poppleton Under Fives is a charity that relies on fundraising to ensure we can continue to run and provide equipment and facilities for our children. 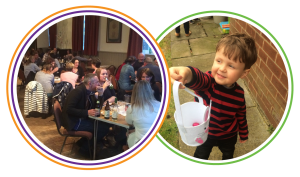 Across the year we host a series of fundraising events from parent social to children’s disco and family fun days. ‘There are many ways you can help support us by either attending these events, donating goods or giving some of your time. It is also a great way to meet new people and hear what else is happening from a wider village perspective! Please see our events calendar for our latest fundraisers. Please let us know if you have any good equipment and toys you wish to donate. We do have a large about already so keep in mind we don’t want to be overrun but appreciate good quality goods that will help our children learn through play. If you’re a business that can help through sponsorship, donations, prizes for raffles and events we’d love to hear from you! We will be sure to sing your praises!